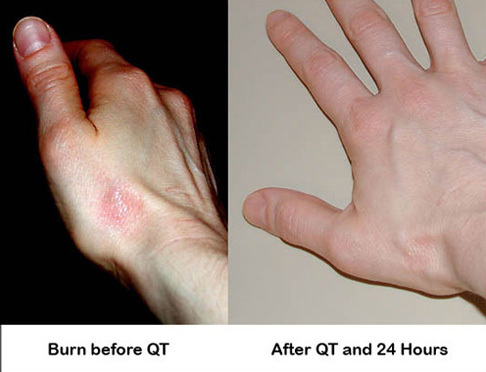 Among the wide range of conditions helped by Quantum-Touch, many people are discovering how effective it is when working with burns. Frankly, I resisted publishing these letters for fear that people would simply not believe that such healing is possible, so I asked and obtained permission to also publish the personal contact information of the people who wrote them. For burn relief and rapid healing whether from sunburn or something more severe, Quantum-Touch can work wonders. My daughter Deepa poured boiling hot water on her hand and she was suffering from lot of pain and lot of burning sensation and a few blisters also erupted. She called me immediately and asked me to send energy with QT. Within three minutes the pain and the burning sensation vanished and another three minutesthe blisters also vanished!! My son-in-law Mahadevan was amazed at the power of the cosmic energy sent to them by me(the channel). "While camping, I experienced a severe burn, which healed in the most unusual way. It was after a night of severe storms. Upon arising without a decent night's sleep, due to lightning, thunder, and water in the tent, I was in a bit of a fog. Several articles were soaked, including the tent. My wife, Debra, and I were cleaning up the campsite, drying things out, and generally getting ready for the day, which was beginning to look beautiful. One article I cleaned was our kerosene lantern, the kind with the white-hot mantle. It needed a thorough cleaning. After disassembly and cleaning, I put it back together and fired it up to test it and dry it out. Kerosene lanterns burn very bright and are really, really HOT. The top reaches several hundred degrees. After the lantern had been burning for a while, it occurred to me that I might not have tightened the screw on top very well and I wanted to move it. Without thinking (remember I was not too clear headed at this point), I reached over to tighten the nut on top of the lantern. In a split second my thumb and first finger were burned instantly. The temperature had to be at least 700 degrees F or more. The skin was charred white and the pain was intense. We had some ice in the cooler, which was my first thought, and it helped somewhat, but as soon as I took the ice off, the pain came back intensely. It was looking like a bad day. It then occurred to us to use Quantum-Touch. Debra ran energy on it for about 20-30 minutes. During that time the pain subsided to near zero and we went out to have a good day. The pain relief was amazing, but here's the interesting part. Ordinarily, with such a severe burn, there is always some blistering and peeling of the surface skin. It stays red for a long time and takes a long time to heal. In this case, there was NO BLISTER, the redness subsided rapidly, and the body simply renewed the underlying skin tissue. Later, the white-charred skin simply sloughed off in the normal process of skin replacement. There was no scar or other indication of a severe burn. If you're ever burned or around someone who gets burned, remember to use Quantum-Touch immediately. The reduction in pain is nothing short of miraculous and the healing process is greatly accelerated, possibly without scarring. This shows how valuable Quantum-Touch is when you have no access to emergency help. Campers and backpackers often have accidents. Quantum-Touch could be a lifesaver in remote areas such as the backwoods. You don't need any equipment or supplies, just your two hands. In other instances, I have used it to reverse a person going into shock, but that's another story." About two months ago I burned my hand while cooking in the kitchen - it was a third degree burn, with a blister in the middle (you can see it in the first photo). My husband, who isn't a big QT believer, was not happy when I ran energy into the burn instead of running it under cool water or applying ice. When I ran energy the burn got hotter and more painful for about an hour, then cooled down. I ran energy while watching T.V., so I was doing something at the same time. Anyhow - you can see the photos of before QT and 24 hours after... at the 24 hour point the burn and blister had completely disappeared. My friend, who is a nurse was shocked... but she couldn't deny what had happened given the photos to prove it. Did He Actually Burn Himself? My 4 year old son leant back against the stove and placed his elbow on the 'turned on' hotplate. Between his scream and the burning smell, I ripped off his pyjama shirt, grabbed an ice pack and set him on the lounge with me while I ran energy into the area which was burned. It was on that nice fleshy part, inside the elbow, and after about 5 minutes we looked to see how bad it was. It came up in 2 blisters about the size of a 10 cent coin. I replaced the icepack and continued to run energy into the spot for about 15 minutes. At this stage my son said it didn't hurt anymore, but I ran energy for another 10 minutes (just in case!). By this stage when we checked it again, the blisters had disappeared, and there were just 2 tiny red scabby like marks, which I then slathered with Shea butter. When I checked the marks again that night, you wouldn't even had known that he'd been burnt! My husband was equally surprised and very impressed. The thing that stuck with me most though, was after being burnt (especially from an Iron burn) the pain comes and goes in waves, even with icepack treatment, and burn creams. (I too, remember how this feels!) But after running the energy into this burn, my son didn't mention any pain at all after the incident. The one thing that keeps it real, is the scorch mark and hole now in his pyjama top! The only thing I kick myself for now, was not taking any photos!!! But of course that is the last thing that runs through your mind amidst a crisis! I suppose for me, experience says it all!" I had taken a large covered pan from the oven, and was distracted by something else when I removed the cover. I inadvertently tipped the cover to the left side, allowing steam to escape and scald my right fore-arm. I immediately ran ice cold water on it for a moment, and then thought I'm going to try QT on it. By this time the underside of the forearm had a bright red patch on it and it was hurting again. I cupped my left hand over the spot and began to run energy. I did all of the techniques we learned at the workshop and I continued to run energy until the pain vanished and for another couple of minutes. This was for about 8 minutes or so, I wasn't timing! I ran some more energy at the spot about an hour later. There was no more pain after that and the big red patch mostly disappeared. Two days have passed without pain and there is only a tiny bit of redness there. A couple of weeks ago I was testing some beans out of the pot and burned my lower lip. It was so painful and hot and swelled up like a big fat cold sore. Rick started to run energy on it and within SECONDS, I said, " Wait a sec" . The pain was gone and when I ran my tongue over it, so was the blister. I ran into the bathroom and checked, and not a trace it was ever there! Greetings from South Africa. My name is Gerhard van Rooyen and I use energy therapy for the healing of family, friends and clients. My wife and I were invited to a barbeque on Saturday 17th July 2004. It had been a wonderful day on the KwaZulu Natal South Coast and the phenomenal " Sardine Run" was in full swing. Needless to say, our friends who were from Johannesburg which is 800 kilometres from the coast, bought a crate of sardines from the seine netters. My friend who prides himself as connoisseur of fine cooking, (he is of Portuguese decent) and his son-in-law grilled the meat and placed it in a stainless meat dish which was then put on the side of the coals to keep hot. Then the sardines were grilled over the rest of the coals. I was in the lounge when I heard my friend's wife saying: "Qickly get ice from the freezer and put it on your hand." When I looked at my friend's son-in-law's hand, it was obviously badly burned. It turned out that after he removed the sardines from the fold-over grill and placed them in a separate container, he had picked up the meat dish on the side that was nearly red-hot from the coals. Right across the centre of the palm was a swollen white welt. On both sides of the welt the hand was very red. I asked him to hold out his hand and held both of my hands with fingers formed into pyramid style directly over the burnt area and sent a spiralling vortex of energy onto his palm from my fingers. (I also invoked the Reiki Symbols with Intention) After about only two minutes he stated that he could no longer feel any pain. I stopped energising and projecting and looked at his palm and there was not a sign that anything had happened. There was no welt, nor redness, no heat, no pain and no emotions whatsoever. Actually he was elated that the severe pain had disappeared as quickly as it had and he kept on saying: "I can;t believe this." From a severely burned palm with all the evidence, and after approximately only two minutes!!! No welt, nor redness, no heat, no pain and no emotions whatsoever. Come on, if this wasn't a miracle let someone convince me otherwise. Single Situation Processing (SSPT) Rapid Eye Technology, Inc.
Now as you can imagine, I am used to what could be called miracles during energytherapy but I was quite honestly blown with the result of this virtually instantaneous and miraculous healing. I believe that the combination of Quantum-Touch - Reiki with Intention proved to be immensely powerful to produce the end result. This event was witnessed by five people beside myself. I have only had Quantum-Touch for three weeks and I know that it is going to change the world. Quantum-Touch is a MUST for all healing practitioners no matter what modalities they are currently using. I burnt my finger very terribly touching a hot plate in the kitchen. I immediately grabbed an ice cube, laid my finger on it and starting running the energy. Darn it hurt! I said aloud. In less than 10 minutes I had no more pain and though my skin showed a distressed area, no blister formed. The plate must have been 300 degrees. Yesterday, while taking my 5 year old son's chicken nuggets and tater tots out of the oven, I received a significant burn between my thumb and forefinger. It was bright red and beginning to blister. I sat down and began running energy on the area and in trots my son who joins in and sandwiches my hands (he has had no formal training, just watches mom and Richard in video) Within 3 minutes the pain was gone, another 5 minutes the redness and swelling was gone and this morning there is no evidence of the burn at all. I am not sure what I am more tickled about-QT working so well on my burn or that my son just accepts this healing method as everyday stuff. When we were done, I said "thanks, you do good work my burn is gone" and he said "no problem, I have good energy" and skipped off. A few weeks ago, I experienced both the trauma of seeing a second-degree burn on my five-year-old son's right foot, and the joy of witnessing the tremendous power of Quantum-Touch. My wife was in the backyard with my son, when he abruptly decided to take off his sandals, and walk up the Bilko door to the basement (a bifold, metal door that is usually built at an angle relative to the house, to provide easy access to a basement stairwell). When it is cooler, he enjoys sliding down it, but that day it was in the ninety's, and the door was incredibly hot. According to my wife, he stepped on the door and started to cry loudly. Because he has Down syndrome, and has very poor expressive language skills, and this was the only response he could muster at that time. My wife immediately ran to him, and put his feet in the cool water of our swimming pool, but he would not allow this for more than a few moments. She then put Aloe Vera gel on both of his feet, and started to notice a blister forming on his right foot. Remembering how to do the 4:4 breath, she started running energy to him. He then fell asleep. Once asleep, she could examine his right foot more carefully, and she noticed that there was a large oval blister (approximately one and one-quarter inches long and three eighths of an inch wide) on the lateral aspect of his foot, and a small round blister (approximately one-quarter of an inch in diameter) on the ball of his foot. Since his feet are only five and one-quarter inches long, these burns represent a significant degree of injury based upon their size, location and severity. After approximately ten minutes, Debra (my wife) then applied some petroleum-saturated gauze to his foot, and continued to run energy. I arrived home after Debra had been running the energy for about thirty minutes, and she then observed that the blister had already started to go down in height (the burn looked still quite severe to me). Together, stacking our hands, we continued to run energy to him for another thirty minutes or so. Now, my son, Michael, abhors having anything too restrictive on his feet; let alone something that is restrictive and gooey. So, having woken up in response to my arrival, his next act was to kick off the gauze with his other foot. Which means that the petroleum-saturated gauze was on his foot for all of about twenty minutes. When he initially got off the couch to walk, he winced when his right foot touched the ground, and almost cried, but stopped himself and resorted to limping, or walking on his tiptoes, for the next three hours. After that, he was able to walk with full weight bearing. Once he was asleep for the night, we examined his feet again. At that point, you could barely tell that he had ever had any blister on the ball of his right foot, and the large oval blister was now almost completely devoid of fluid, with only a little white area in a largely dark pink oval that was now flat. By morning, Michael's right foot now had a much lighter pink color where the large oval blister had been, and you could barely tell that he had ever burned his foot. In the days that followed, the skin in the area of the burn became indistinguishable from the surrounding tissue, an only today, twenty-three days later, did it start to painlessly peel off. This experience for me, having seen burns in a variety of situations, illustrates the incredible power of Quantum Touch and its applicability to a wide variety of conditions." Recently when I was staying in a hotel, walking down the corridor, a little girl about 7 or 8 was walking toward me, in front of her mom, dad and brother. She looked at me and held up her finger and said, " I just burned my finger on my mom's curling iron." I said, " Well, let s hold it like this for a minute." I gave it some QT, and it was fine. The same thing happened to me the other day. I was using an iron and touched it, saw an inch long narrow blister forming, gave myself QT, and it was gone! It happens so frequently, it almost takes more time to sit down and write it out than it takes to give myself or someone QT.